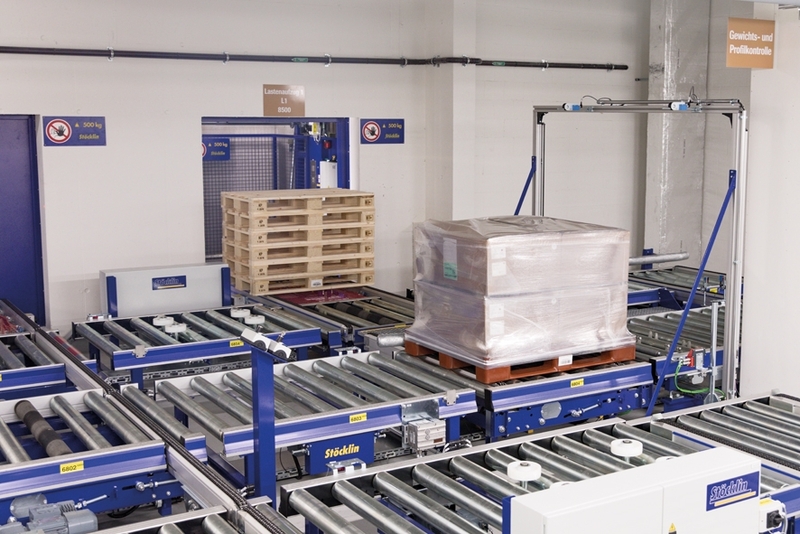 Aiming high... or when you're running out of space – Stöcklin Logistik AG. Förder- und Lagertechnik. For a period of over 100 years, since it was founded in 1896, Roche has made important contributions to the health of the world population and today it is one of the market leaders in research-oriented health care technologies. The company, with headquarters in Basel, Switzerland, unites the strengths of the two business sectors of pharmaceuticals and diagnostics and, as the world’s largest supplier of bio-technology, develops differentiated medications for oncology, immunology, infectious diseases, ophthalmology and the neurosciences. The Roche Group is active in over 100 countries and employs a staff of over 94,000 worldwide. F. Hoffmann-La Roche AG is known for investing in state-of-the-art research and development facilities, attractive workplaces and long-term areal development. Current infrastructure projects include a logistics center outlining state-of-the-art requirements in terms of energy, hygiene and safety as well as the guidelines of Good Manufacturing Practice (GMP). 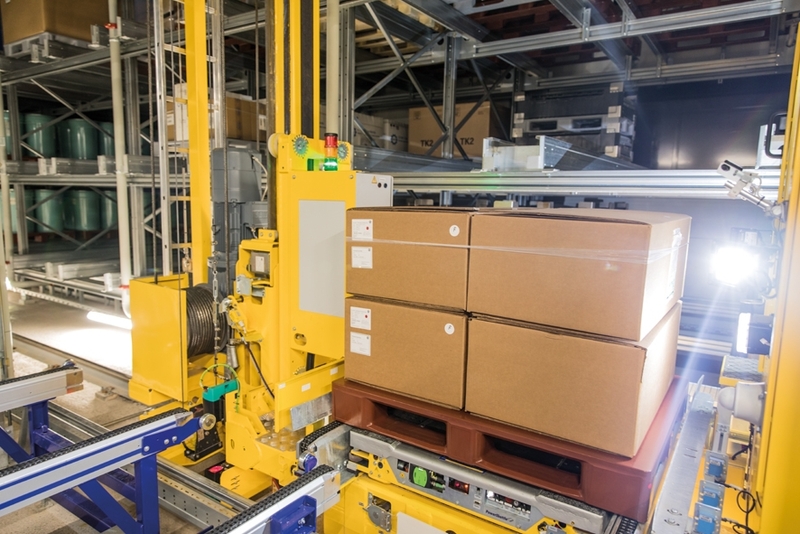 To adequately satisfy the increasing, worldwide demand for bio-technically produced medications, requiring refrigerated ambient conditions for production and storage, the company has decided to upgrade the existing building. Due to the space limitations at the Basel headquarters, the project could not be accomplished through normal horizontal expansion. Creatively, those responsible for the project at Roche, have found an ingenious solution: They adapted their plan to a multiple story logistics building in current and future requirements by adding additional floors. It was necessary to implement this project without disrupting current operations or production. 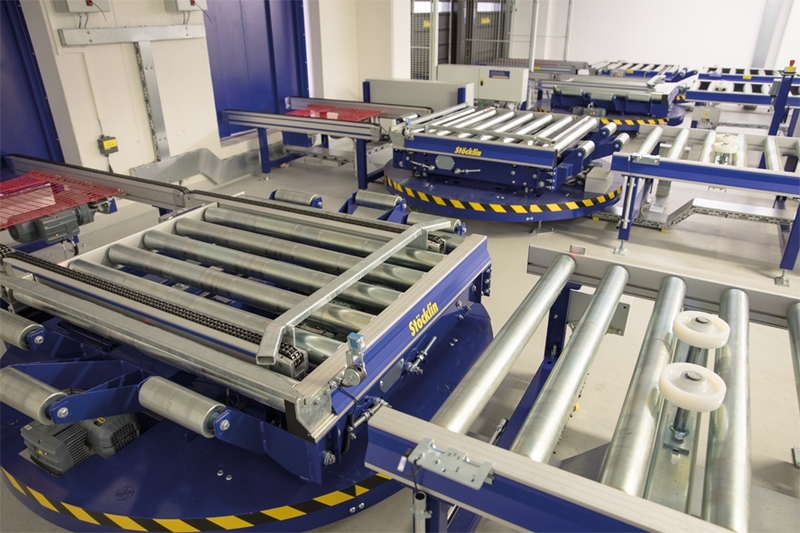 Throughout the selection process, Stöcklin prevailed against a number of well-known competitors by our innovative technologies and “Out Of The Box” design concepts. 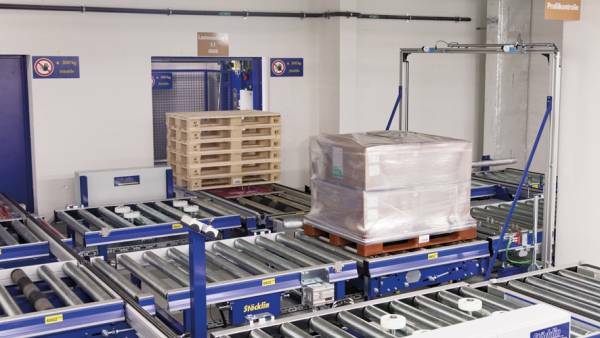 “Not only did the Swiss intralogistics system supplier and general contractor submit an attractive offer, they simultaneously added selective optimizations to the present concept”, said Charles Meyer, Head of Logistics at Roche, when explaining why the contract was awarded to Stöcklin. As a result, the starting shot for this ambitious project was fired in December 2014. The objective was to expand the 8-story logistics building (Building 41 East) vertically with a nearly 15 meter high, fully automated high bay warehouse with approximately 12,450 pallet storage bays, extending over the entire length of the building, going up and not out with the expansion. This additional space was intended to store raw materials as well as packaging materials and finished goods, with varying physical and chemical properties for in-bound, as well as, outbound applications. 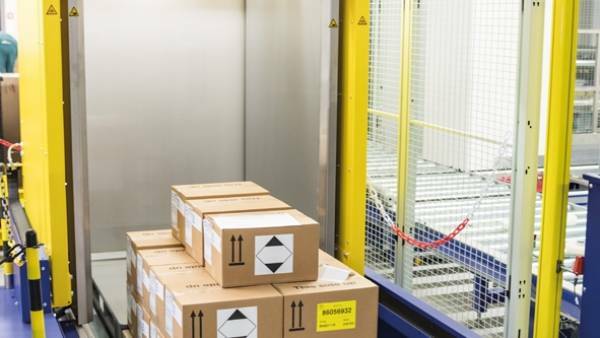 To optimize utilization of the limited space available, the facilities were designed for multiple deep channel storage, which requires comparatively little space. 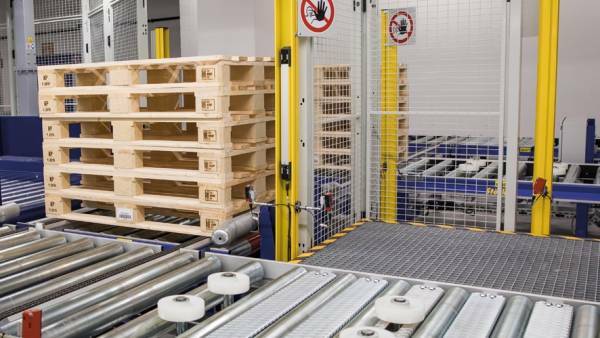 This system allows a number of pallets to be stored at multiple depths in the racks, while realizing maximum storage density in parallel. 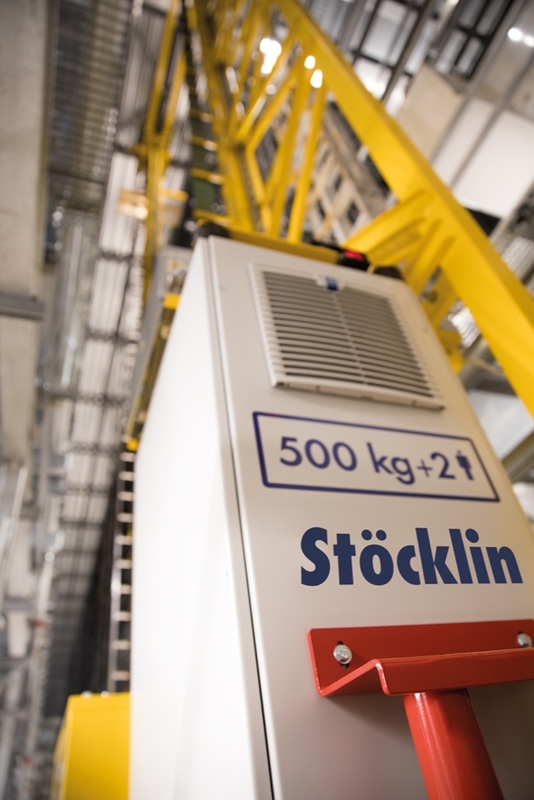 Storage and retrieval operations are accomplished using “PowerShuttles”, produced by Stöcklin. These consist of channel or carrier vehicles transported by the Unit-Load stacker cranes to a point in front of a channel in the shelving, where they move in horizontally on rails. This addition, using a rack supported building, was realized starting on the eighth floor or which at that time, was the top floor. The installed channel storage facilities are divided into two areas by a fire protection / climate dividing wall. The major portion is reserved for storing goods at ambient temperatures of +20oC. This ambient zone offers approx. 8,850 pallet storage bays in two 60 m long aisles, served by two 14 m high stacker cranes with PowerShuttles. 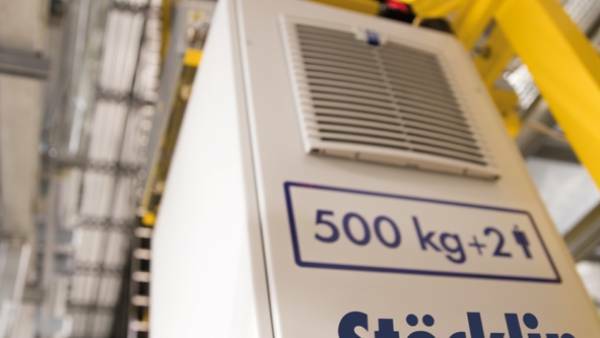 The Unit-Load stacker crane from Stöcklin’s, the MASTer 12-T series, laid out for 29 double operations, is also in use in the refrigerated storage area, with a prevalent, constant temperature of +5°C. Here temperature-sensitive substances and preparations are buffered in approx. 3,600 pallet bays. 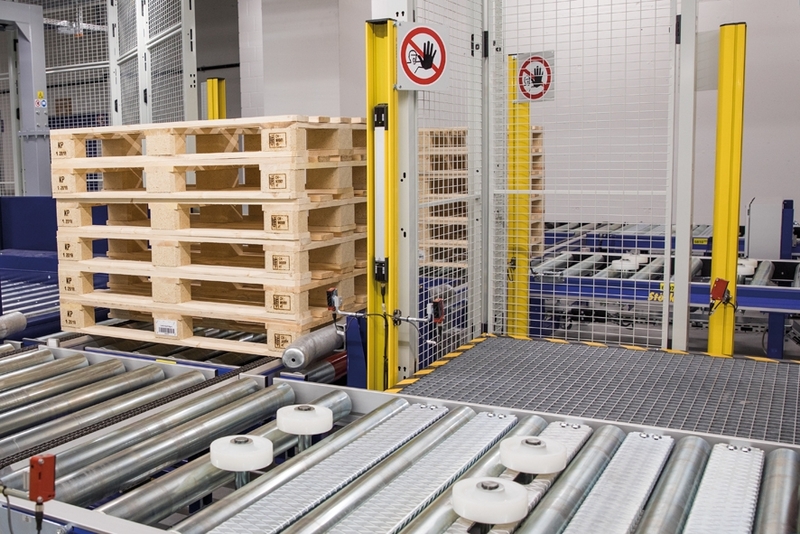 The aisle length is 30 m. Just as its “colleagues” in the adjacent ambient temperature storage area, the PowerShuttle, when in use communicates with the stacker crane, via radio, without any cable connections. Positioning of the stacker crane is accomplished by a laser measuring device in combination with absolute encoders and sensors. Proper operation of the PowerShuttle in the various climate zones, whose temperatures are continuously checked in keeping with GMP (Good Manufacturing Practice), is ensured by an integrated energy management feature. This monitors the heat development and operating voltage in the SuperCap cells. The current charging is known to the SPS, ensuring that the vehicle can return safely to the stacker crane before dropping below the designed minimum limit. 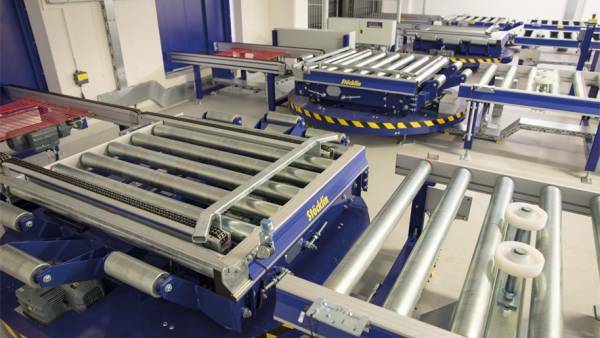 The double layer capacitors, the SuperCaps, require only 10 seconds of charging time on the stacker crane’s pressure contacts following each run. “Another major advantage of these low maintenance energy storage devices is their long service life of one million charging cycles”, continued Urs Martin. 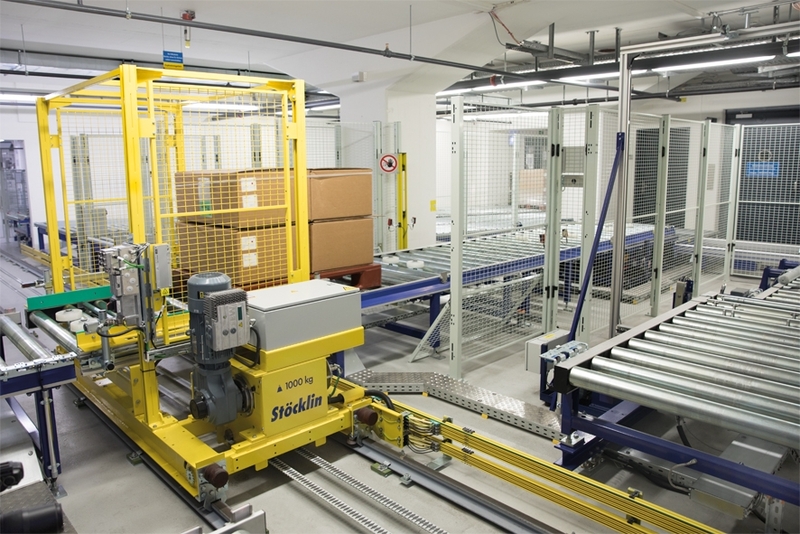 The new high bay warehouse is served by two automatic pallet elevators with an installed height of 26 m from the ground floor. Moreover, connecting conveying equipment routes were installed on the seventh as well as the eighth story during the initial phase. Urs Martin can remember well the challenges to be mastered in this design development. The receiving as well as shipping departments for the entire new facility are located on the ground floor. 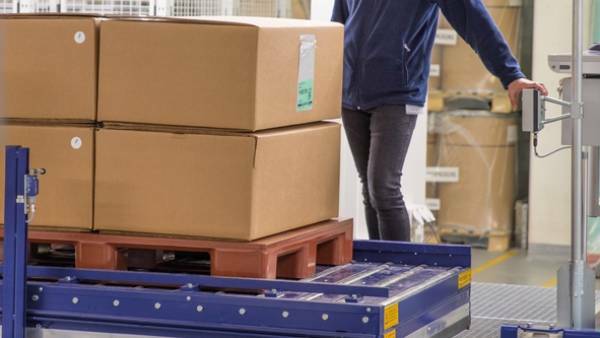 Load units to be tracked are transferred manually from wooden to plastic pallets, the loads are checked, secured with shrink wrap by a fully automatic wrapping unit, if required, and transferred to the conveying equipment at floor level. They are then transported on to the eighth floor, i.e. the high bay warehouse by pallet elevators. The load is limited to a maximum of 500 kg per pallet. The picking area is located on the seventh floor. 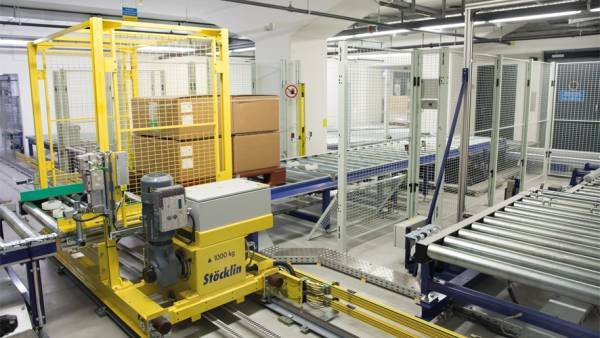 At Roche’s request, Stöcklin equipped this area with a variety of ergonomic features to facilitate the warehouse workers. This includes elevating platforms and height-adjustable handling surfaces and an optimum arrangement of the monitor, keyboard and printer further increases operating convenience. In the course of retrieval, requested pallets travel analog over one of the two installed cable elevators to the ground floor, where they are positioned on a retrieval element without back pressure by gravity feed conveyors at floor level. 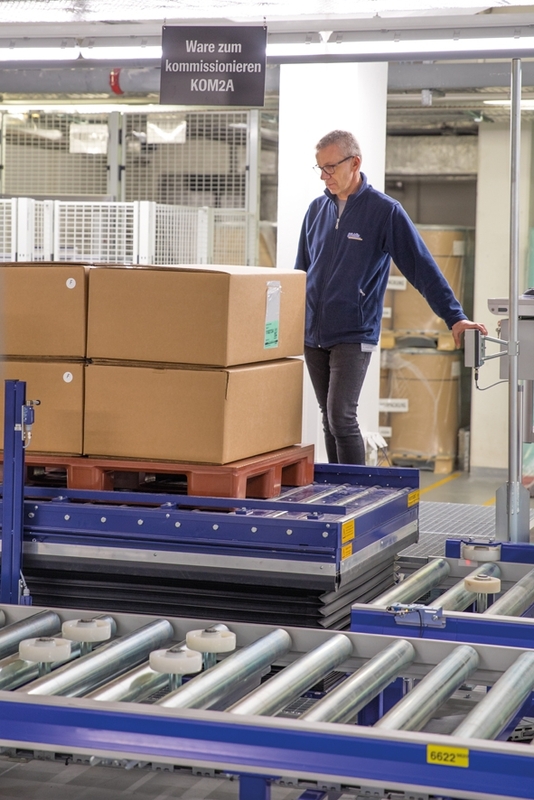 The material flow includes continuous optimization to the current daily requirements, which is controlled by the newest generation of the StöcklinWCS (WCS = Warehouse-Control-System), and is connected to the present warehouse management system (WMS) with which it communicates. The WCS also includes a WinCC-based 2D visualization feature. 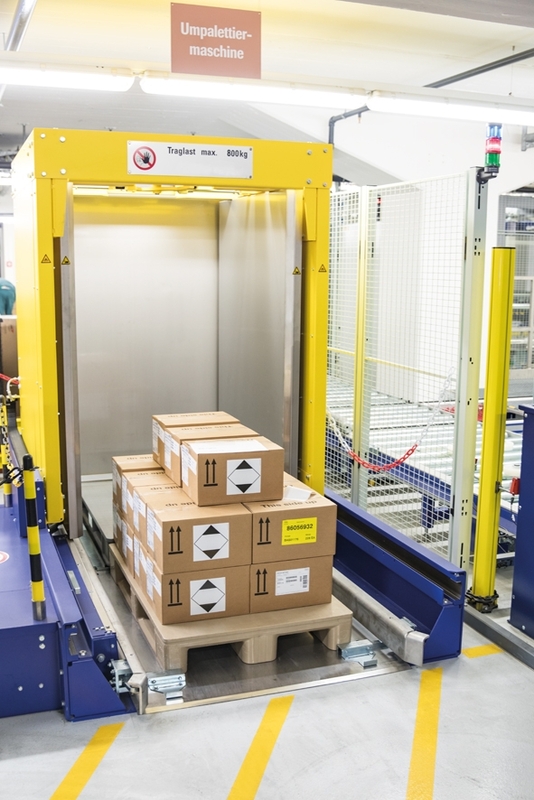 This system offers a variety of features for monitoring automated processes from placing the goods on the conveying equipment to storage in the channel storage facilities, continuing all the way to retrieval and shipping. 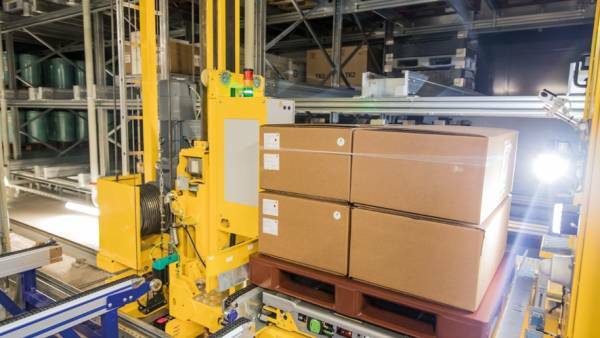 The new high bay warehouse, stacked on top of the existing building and connected to the conveying equipment, also serves to supply production, and has been in use by Roche since its successful Go-Live date in December 2017. In addition to the shaft for the pallet elevators, the expansion includes a new fire escape staircase and an elevator for firefighting personnel. Moreover, the building was reinforced structurally with a vertical steel framework (seismic reinforcement). From the outside, the appearance of the building sees an enduring and linear, timeless design based on the architectural designs common for the Swiss pharmaceutic company. The many challenges presented by the project were mastered expertly by the open cooperation between the Roche and Stöcklin teams from the planning phase right up to commissioning. Roche’s proactive support facilitated smooth progress in the face of these challenging conditions presented by needs for uninterrupted operations.